When it rains it pours. I am starting to notice a trend- at this moment there are a bazillion awesome dramas airing, a bazillion awesome varieties airing, a bazillion bits of Running Man news, a steep increase in the amount of time my grad school homework takes, the yearly gazillion hour workweek I call budgeting hell and a steep decline in my hours of sleep. Correlation? I think so. But who needs sleep when you have Running Man! Seriously…I tried it the other day while re-watching episode 130 and I ended up finishing the show. Because it was way better than that whole rest your brain act. Cheers! Low ratings. On that note…. I would totally watch this. And laugh. Big brother is watching… the Running Man cast?! Episode 151 is full of security cameras and the promise of the “ultimate chaser” Jung Woo Sung (actor, Cold Eyes). This entry also features Woo Sung’s Cold Eyes costar’s Han Hyo joo and Junho (2PM). The film Cold Eyes revolves around a team of detectives that use advanced surveillance to take down a gang of bank robbers. Here is guessing a similar premise will dominate episode 151. Check out the preview below! Now on to the headlines! PD Jo fighting! 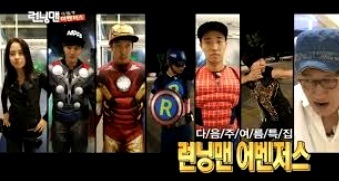 Check out episode 160 for the moment Running Man finally overcomes MBC’s adorable DWAWG kids! Okay, I admit the lack of sleep and Running Man fandom has led me to hope that we will see them face off in a an extremely inappropriate kids versus adults name tag ripping race. Does that make me a bad person? A worse person because I know those kids don’t stand a chance? Perhaps, but we have more headlines to get to before we pass final judgment! The streets of Seoul were left at a standstill (well…at least some streets) as Yoo Jae Suk took to the stage as a DJ. Running Man’s grasshopper was busy filming a water park CF on June 16th. As part of the filming he gave a riotous performance as a DJ- a free show for anyone who happened to wander by. Why did my June 16th not involve this! Seriously! How much green does a grasshopper make? Looks like the grasshopper may not like green but finds it liking him instead. But hey- this guy works super hard and is humble all the way. If there is one celebrity I think deserves the big bucks it is this guy! Lizzy also said she would come back as a fixed cast member if she was ever asked. This bit of news- more specifically her depression over leaving- got to me. I liked her on the show and honestly never considered how she felt when she left (call me shallow but after only a few episodes her departure had nowhere near the effect on me that Song Jong Ki’s did). Lizzy-Hugs! Running Man Cast heading to China with Park Ji Sung!! !